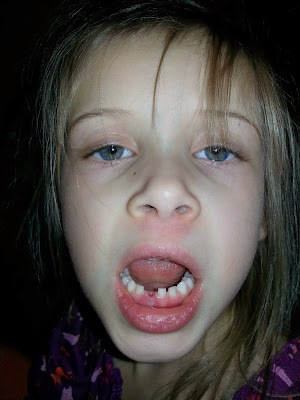 Women on a Mission: Mom Edition: KD lost her first tooth - and drama ensued! We had a big event in the Denham house on Thanksgiving Day. I’ve been saving up the exciting news since Lori’s been posting at the front of this month. KD had a noticeably loose tooth for a couple of days as we approached Thanksgiving (the dentist had proclaimed in June/July that it was oh-so-teeny-bit loose). We kept telling her not to mess with it, since if the baby tooth falls out too soon, the big tooth beneath it is exposed and might get damaged if it’s not ready to come up yet. She listened as well as if we’d been talking to a wall, and wiggled away. I remember wiggling my loose teeth as a kid too, though, so I tried not to be too much of a nag about it. Ok, back to my KD. Right after DINNER, KD and Aunt Heather were wrasslin’ and kicking (like when you hold a baby’s ankles and do the running thing) and Heather let go, thinking they were done wrasslin’ and KD kept kicking and kneed herself in the mouth, knocking her loose tooth right on out. She grabbed the tooth from the floor, blood coming out of her mouth, and said, “you knocked my tooth out!” We all started laughing (because we’re GOOD PARENTS) and she ran off and hid. Then we told her it was totally awesome, she came around, and Easy Mac started pouting because she didn’t have any loose teeth and wasn’t getting any attention (the pouting lasted for weeks until a few days ago when her tooth started to get a little wiggly). Freshly popped out. And a cold to boot. See her self-haircut growing in straight across her hairline? She's the total package. So after bed that night, Shaun and I got into a HUGE FIGHT (exaggeration, but it sounds better) over how much money to leave. 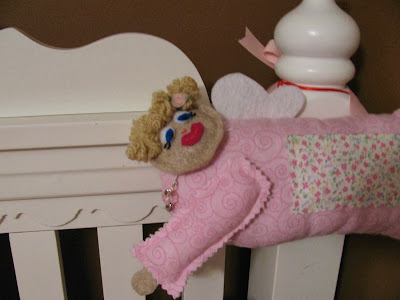 Remember from my tooth-fairy-making post here how I talked about leaving $20 since my mom thought the tooth fairies I made were ugly (she’ll dispute this, but she totally meant it with her *demeanor*). Per Shaun, even a $5 bill was out of the question, since he and I each got a quarter for our teeth. Uh, I reminded him, “THAT WAS 30 YEARS AGO!”* “NO, IT WASN’T,”* he said. “YES IT WAS, BECAUSE YOU ARE 36 NOW, SO YOU STARTED LOSING TEETH WHEN YOU WERE 6,”* said I. This was clearly solid logic, but he still was not budging. So I said, “FINE, THE MONEY IS ON YOU IF YOU’RE SO CLEVER.”* and ignored him completely after that (the last part is also an exaggeration, but the * reflect actual quotes). So, my sweet KD lost her first tooth, and found 8 quarters in her beautiful tooth fairy the next morning. She was very excited. When I get my turn at the money for future teeth, some $5 bills will totally be involved. You see, you pick your battles, ladies. It’s a marital fact. Shaun thinks he won that round, but no, I just let him have it. I’ll dish out the clams from here. They say, “happy wife, happy life” but I say, “a clever wife is happiest of all."